Scientific Blogging has an intriguing story up about how one group of scientists is working to reproduce musical instruments that had previously been lost to antiquity... along with the the unique sounds that they produced. One such instrument is the barbiton (right), an early type of bass guitar. Do you long to hear the dulcet sounds of the salpinx, barbiton, aulos or the syrinx? Of course not, because no one has heard them in centuries. Most people have never even heard of them. But you will soon have the chance to experience musical instruments familiar to ancient civilizations but long since forgotten. Ancient instruments probably got lost because they were too difficult to build or too difficult to play. The ASTRA (Ancient instruments Sound/Timbre Reconstruction Application) team is tasked with bringing them back to life and already have successfully reconstructed the sound of an earlier instrument called the 'epigonion'. The team has been so successful at reconstructing these instruments that they plan to have a concert with their own "Lost Sounds Orchestra" later this summer. I'd love to see them do this with Stradivarius violins. They are so very rare, and so hard to get. AND very expensive. If they can replicate the sound and create more violins that sound like original stradivarius violins, that would make those violins more affordable to buy. Hi Chris! I have to say that this is one of my favorite stories from International Science Grid This Week, which is where Scientific Blogging picked up the story. You can get a lot more information about the project on the iSGTW site. Alas, the instruments aren't being rebuilt physically. The sounds they made are being simulated electronically. 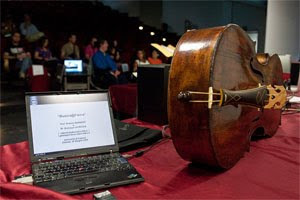 Then they are mapped to a modern electronic instrument (such as a keyboard or midi guitar) in order to make the Lost Sounds Orchestra possible. So unfortunately, I'm not sure that doing this with a Stradivarius would accomplish what you are hoping it would accomplish. Although technology can give us a fell for what the instrument must have sounded, I believe there is nothing like the real thing.